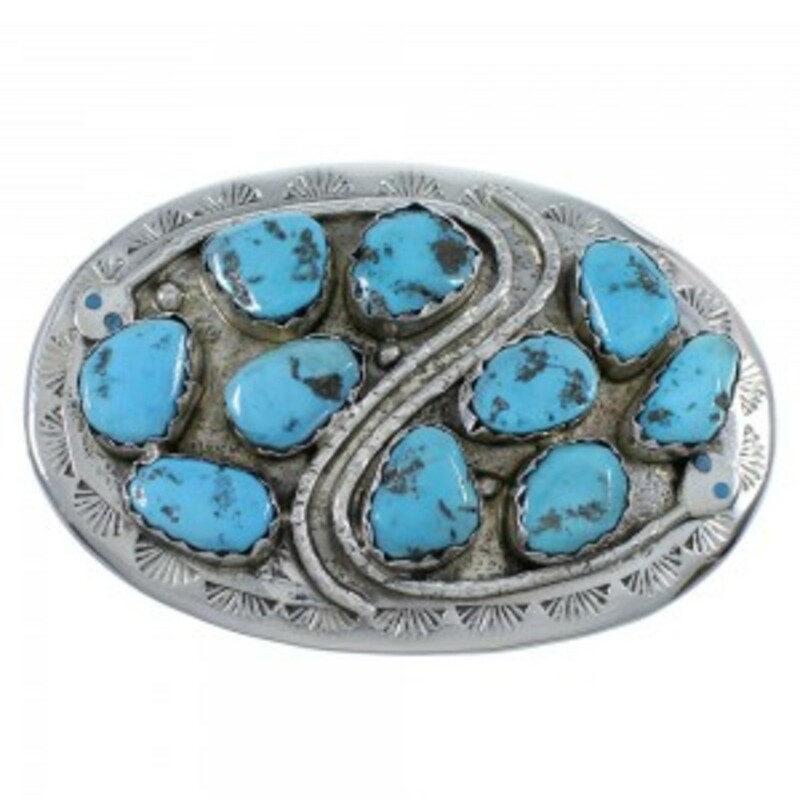 Another Native American style of silver jewelry is made by the Zuni Pueblo people. They are located on a Pueblo reservation approximately thirty miles southwest of Gallup, NM, with a population of about ten thousand. While they learned silversmithing from the Navajos, they have a unique look to their jewelry that is different from the Navajo jewelry. They are known for their lapidary (cutting, polishing and shaping stones) artisan skills and intricate stone inlay designs. 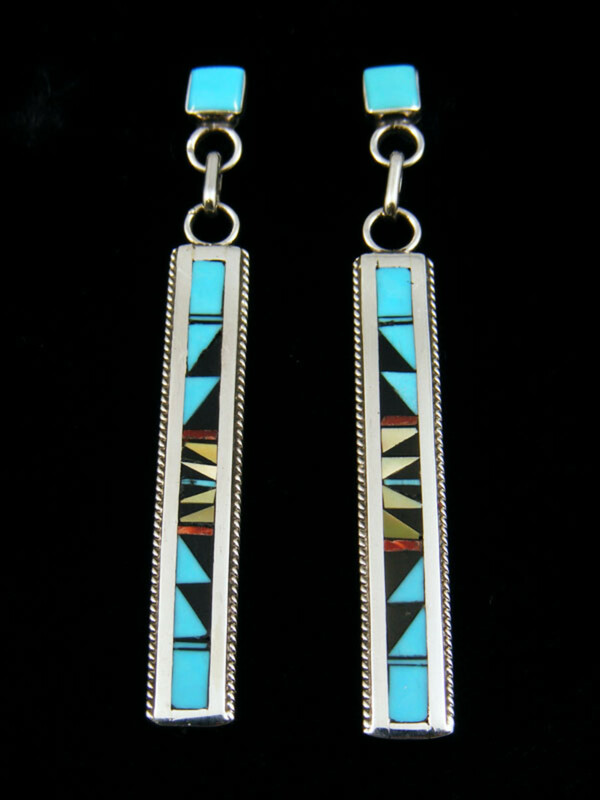 They are the southwestern masters of inlaid silver and turquoise jewelry. The Zuni, then, shared their lapidary work with the Navajos, Hopi and other Pueblo peoples. Much of their designs include other stones besides turquoise such as coral, jet (a black stone), and white mother or pearl. 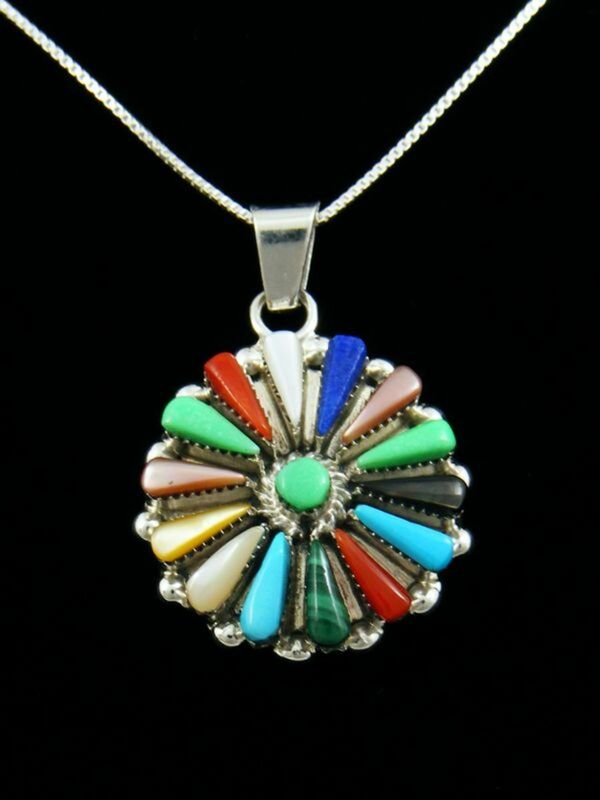 If you see a piece of inlaid jewelry with those colors it probably was made by the Zuni Pueblo people. Use of turquoise and coral as personal adornment by southwestern natives dates from prehistoric times and the use of silver by Navajo, Zuni and Hopi natives is only approximately one hundred years old. 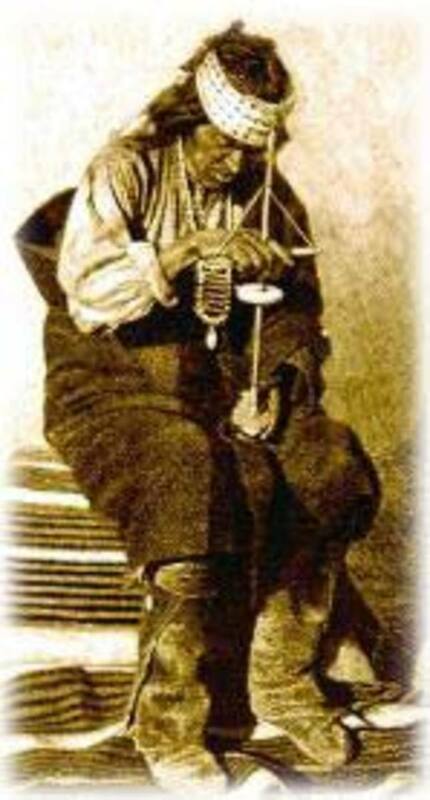 Lanyade is believed to be the first Zuni to learn silversmithing from the Navajos around 1872. He in turn taught it to the Hopi native tribes. 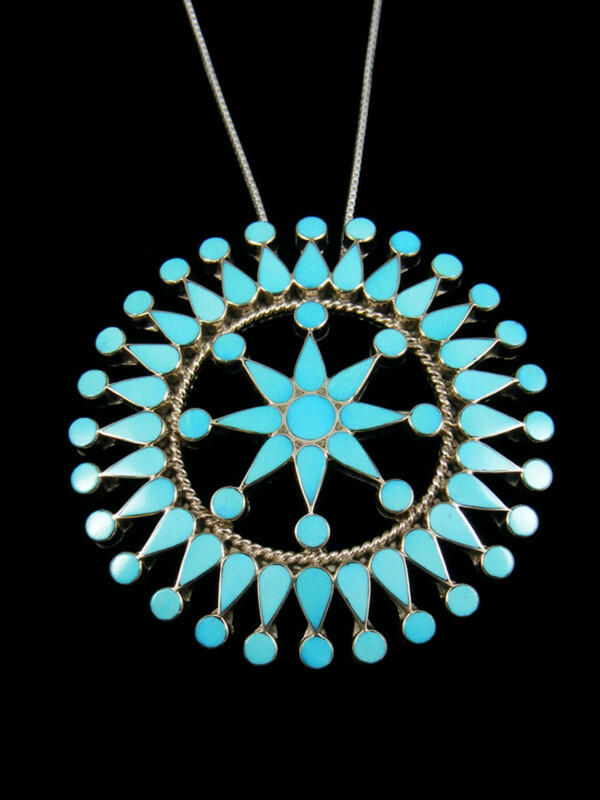 Keneshde is believed to be the first Zuni to set turquoise to a piece of silver jewelry around 1890. The native American tribes are a very proud people with much dignity. They do not allow many Anglos into their culture, especially their religious culture. That is why we say, "it is believed," when speaking and writing about the natives. They neither deny nor confirm if what we say or write about them is correct. They are their own sovereign nations within the U.S. and keep their nations very private. So please bear with me on the names and dates of when things happened. 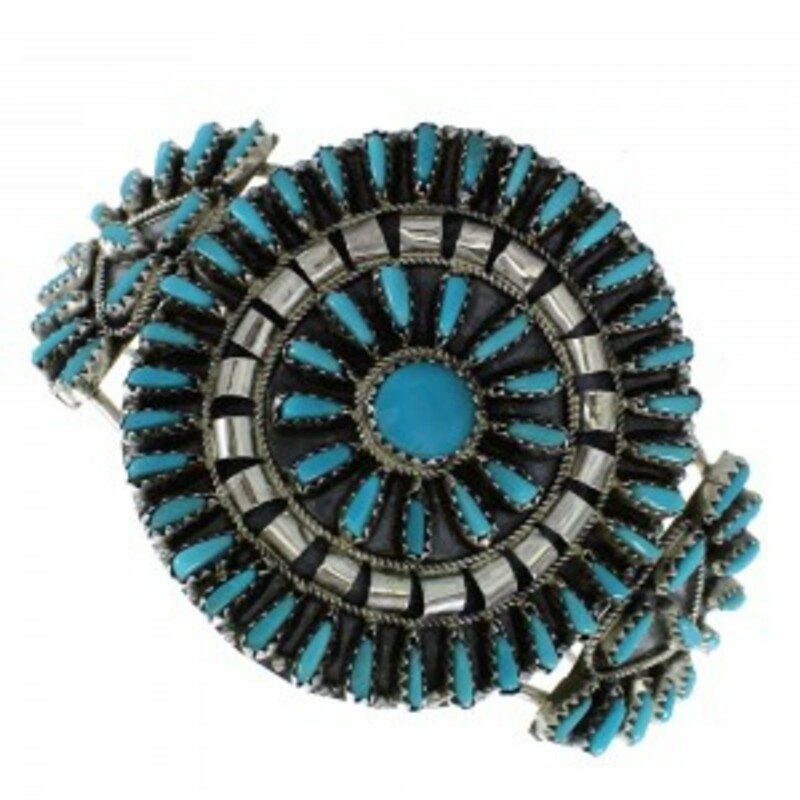 Navajo Native American handmade turquoise and silver jewelry is stunning to wear. Diamonds are a girl's best friend. But, have you ever considered wearing turquoise and silver jewelry hand- crafted by Native Americans? Which is your native American jewelry style preference? The Zuni Pueblo tribe is very traditional and religious and their stone lapidary skills have come from ancient times more than a thousand years ago. Their lapidary skills which developed over many years were easily applied when they learned the art of silversmithing. Now, with the art of silversmithing they took their stone decorative jewelry to another level. They are best known for their complex channel inlay designs and for their fine turquoise petit point and needlepoint designs. 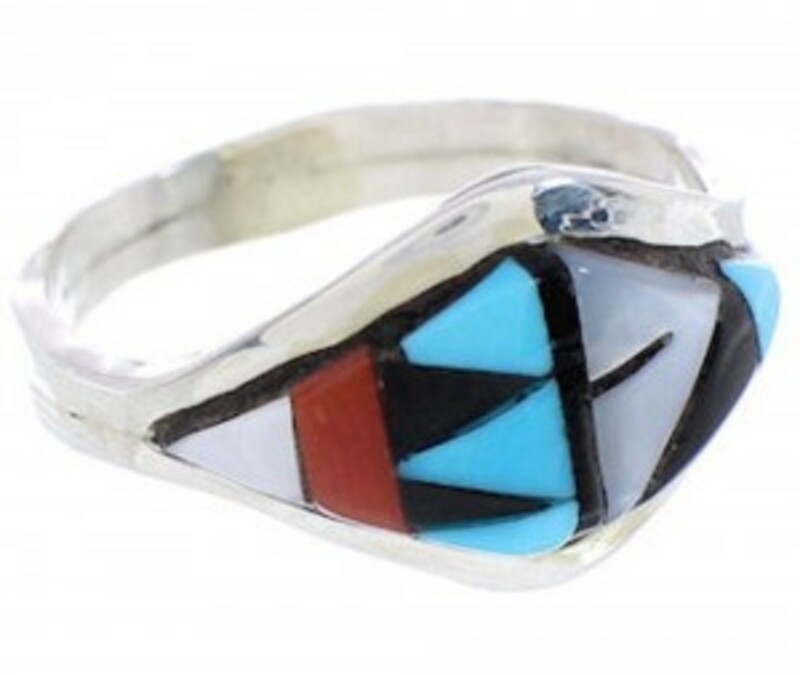 For centuries, the Zuni have worn jewelry made with simple designs of turquoise and other gemstones, but it was the art of silversmithing combined with their stones that created such a beautiful art in jewelry. Over the years, the Zuni have slowly developed their own unique techniques and styles to their silver jewelry making. As the demand for native American fine jewelry grew in the southwest, the Zuni jewelry makers became much in demand and well known for their extraordinary work of combining their lapidary work within their jewelry designs. Unlike Navajo jewelry that often uses chunky stones, Zuni stone jewelry uses carefully cut, crafted and polished stones set in intricate arrangements. 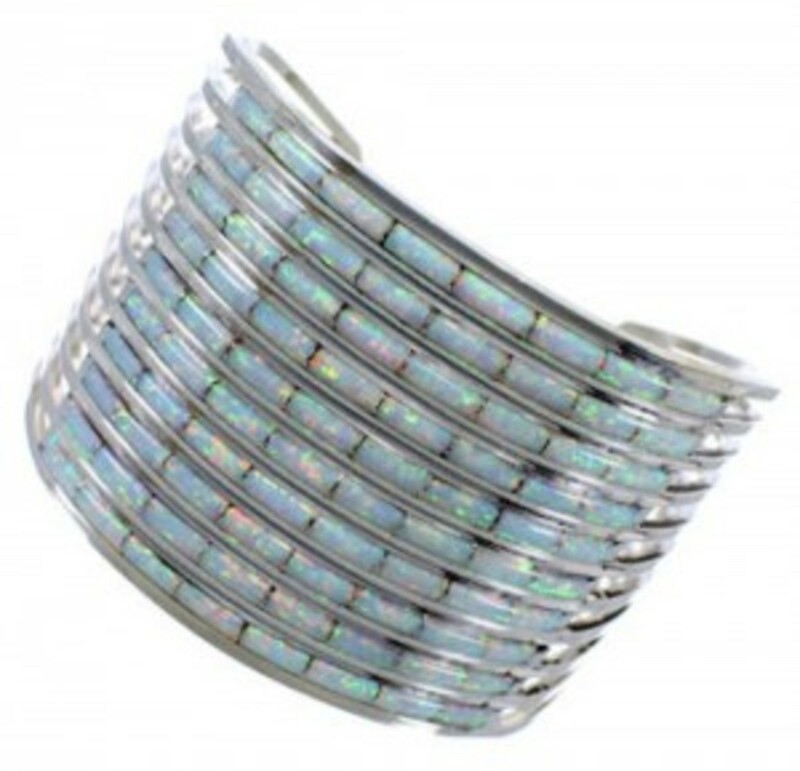 Their most famous style, the channel inlay technique is done by accurately forming channels in the silver base and then carefully inserting stones into the channels in particular patterns, shapes, and colors. These techniques require great precision when cutting the small stones and the Zuni have mastered this. The inlay can be flat, raised, etched or sculpted into the silver. Although, turquoise is found on a majority of native American jewelry, the Zuni use a wide assortment of stones and skills to give a variety of colors in their designs that is not found in Navajo jewelry, for example. The Zuni also became skilled with the petit point and needlepoint technique (sometimes these terms are used interchangeably) done by setting very small tear, egg, pear, or oval shaped piece of turquoise into a design. 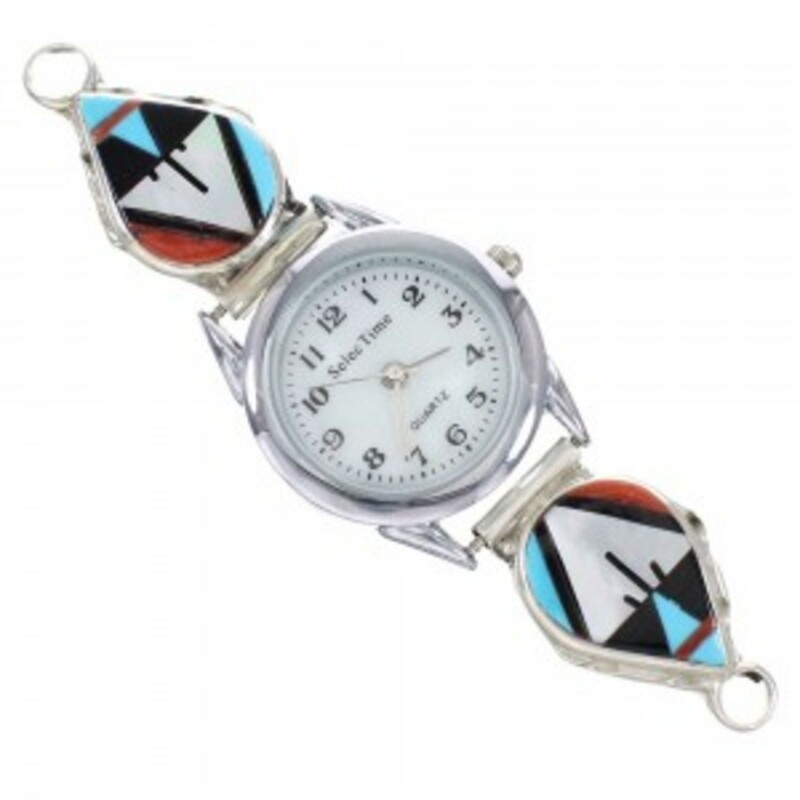 The Zuni have taught the Navajos how to create this type of design and both the Zunis and Navajos make this design of jewelry so when buying these designs be sure to ask the dealer or vendor who made the jewelry piece. And, remember to look on the back for the number 925 that signifies sterling silver and for the artist's initials or name. All my native American jewelry pieces are marked 925 and signed (engraved) by the artist. When buying native American jewelry ask as many questions about the piece as you can. Which native tribe made the piece? which stones are used? in which state was the stone mined? Which specific mine does the stone come from? which specific artist made the piece? 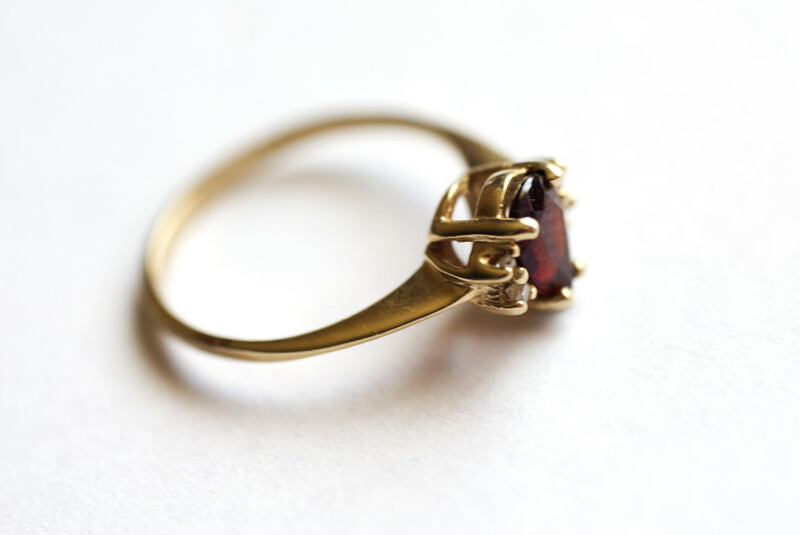 Is it a contemporary, vintage, or antique piece? The more questions you ask the vendor the more he will realize you are serious about native American jewelry and less likely he/she will try to take advantage of you. In most cases the vendor will offer you a better (lesser) price. 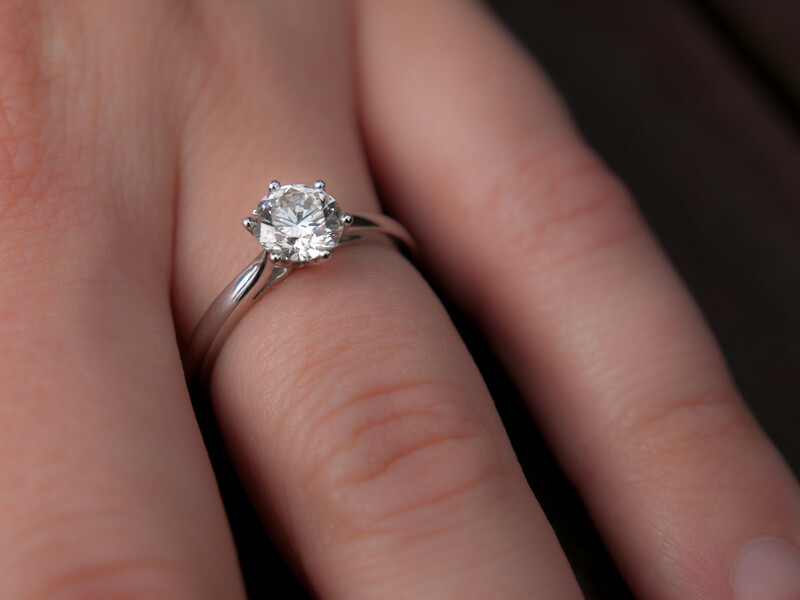 It is okay to negotiate a price with the vendor, even in a fine jewelry store. I have negotiated better prices for all my native American jewelry. If they refused to negotiate just walk out the door; nine times out of ten they will call you back in and give you a better price. Also note, you will find the best prices for native jewelry right on the reservation. It is priced what it is really worth with not much of a mark up. I try to buy as many pieces as I can from the Taos Pueblo two miles up the road, as their prices are right and the quality of stones is excellent. They are all signed and stamped sterling silver. 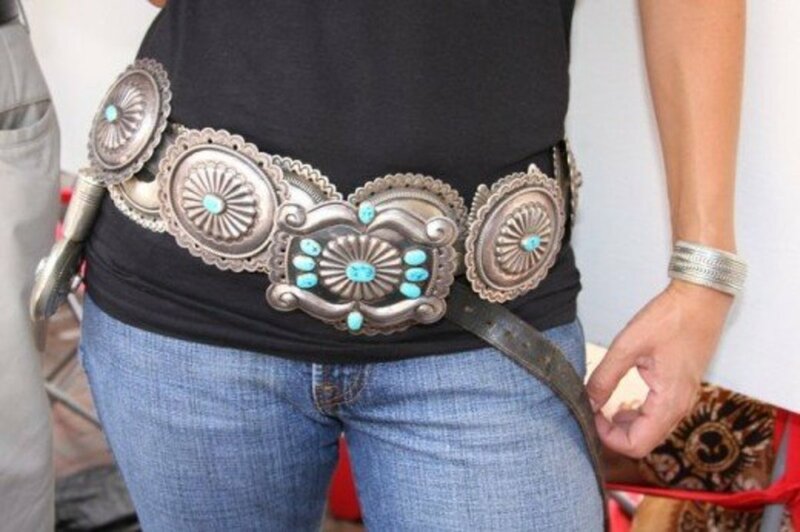 If you are not in the southwest, you can find reputable websites that sell genuine silver jewelry. I can't vouch for the prices and you probably can't negotiate with them. The following photographs are made by Zuni Pueblo native jewelers. Since they shared their skills with other native tribes, you will see some of these also made by the Navajos. The ones here are only Zuni handmade creations and all stones are genuine. Dianna, Thanks so much for reading. Those particular earrings are beautiful and the ones I like best also. The earrings are my favorite. I love the long design. I learned something about the tribal preferences in jewelry making. 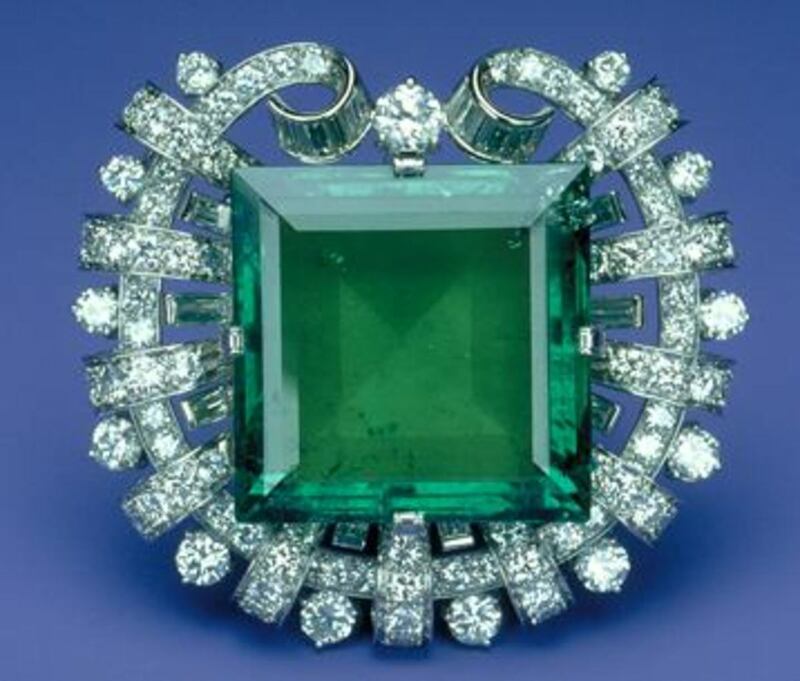 MizBejabbers: Sounds to me that piece of jewelry is Zuni made, and it sounds beautiful. I am glad to hear it is signed and stamped 925. That means you have a real fine piece of jewelry. I am so glad you are enjoying these jewelry hubs. My next one will be about Hopi native jewelry. Kristen, so glad you enjoyed reading this. Turquoise jewelry has always been a favorite of mine. I wear it more than any other type of jewelry. So glad you found this informative. Devika, thanks so much for reading. Yes, isn't this jewelry beautiful? I am so glad you found this informative. Thanks for reading, Bill and I am glad it was informative for you. I love this article, so please keep them going. Now you have me curious with this great information on Zuni pieces. As a Christmas gift, my niece who lives in Albuquerque gave me a contemporary piece with turquoise, coral and white mother of pearl channel set in a piece of a geometric puzzle. If you put umpteen of them together, they would form a sun disk. It is signed and contains the 925 stamp. The silver has not been coated and requires polishing nearly every time I wear it. Your description sounds like it could be Zuni. I really don’t care that much for the needlepoint pieces, but that’s just a personal preference. My Cherokee husband likes them. Suzette, great lens! Like Nell, I do love turquoise jewelry. I have some I haven't worn in years. A fascinating hub to learn about it. Wow! So beautiful and had no idea of this type of jewelry. I learned lots from this hub. Interesting and unique. I Tweeted! I love to learn; ergo, I loved this article. Thanks Nell. This is my current craze! I love it and could buy up all these pieces but my budget couldn't take it! Hiya, I love Turquoise ! great hub!Interesting to read about who started to make the jewelry too. love silver, and the color with it is amazing! nice one Suzette!